One face of each Trimboard is AZEK's Traditional surface (shown above) which closely matches regular painted wood. The other face (except 1-1/4" thickness) is AZEK's Frontier surface (shown at right) which closely resembles weathered wood that has been painted white. Because the Frontier surface has a slightly raised, simulated "grain" pattern, the Traditional surface is a better match for most painted trim. 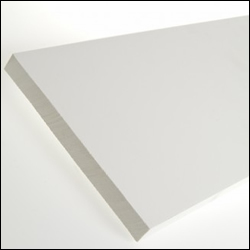 1-1/4" thick Trimboards have the Traditional surface on both sides. Quantity discounts available. Use the Thickness & Width dropdown below to order a free sample. We'll send our size choice. Or, use the Length dropdown to order a 3" long sample in your choice of standard width and thickness. 1. Actual measurements are listed in Thickness & Width popdown below.